containing proteins (Figure 10.1). In addition to these classical signaling mechanisms, the C-terminal tail of Eph receptors can bind PDZ domain-containing proteins6'7. Guanine nucleotide exchange factors (GEFs) are another class of molecules that bind the cytoplasmic domain of Eph receptors independent of SH2 domains8-10. 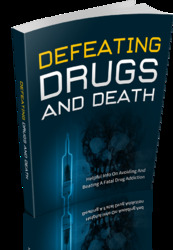 Although traditionally regarded as ligands, ephrins themselves can act as receptors that transduce signals into cells on which they are expressed. In this case, binding by Eph receptors triggers this "reverse signaling"11. Since ephrins do not possess kinase domains, reverse signaling does not involve stimulation of intrinsic kinase activity. Yet B-ephrins are phosphorylated by cytosolic Src family kinases and phosphorylated B-ephrins can be recognized by the SH2 domain-containing adaptor protein Grb412,13. Like Eph receptors, the cytoplasmic tail of B-ephrins binds PDZ domain-containing proteins14. Figure 10.1. Domain Structures of Ephrins and Eph Receptors. Transmembrane ephrinB is shown as a representative ligand. Molecules known to interact with ephrins and Eph receptors are shown in rectangles on the right. Y, tyrosine residues; P, phosphate. we review progress in our understanding of the role of these remarkable molecules in spine formation and synaptic plasticity (see also Chapters 17 and 21). Although ephrins and Eph receptors have been studied in the context of the nervous system from the beginning, earlier studies were almost solely focused on axon guidance and segmental patterning during embryonic development (reviewed in ref. 1). The discovery of ephrins and Eph receptors in synapses was rather incidental. Torres et al.6 screened for binding partners of the C-terminal tail of EphA7 and EphB2 by the yeast two-hybrid system and identified two synaptic PDZ domain-containing proteins, namely PICK1 and GRIP. This immediately prompted immunocytochemical localization of EphB2 and ephrinB in synapses in cultured hippocampal neurons. 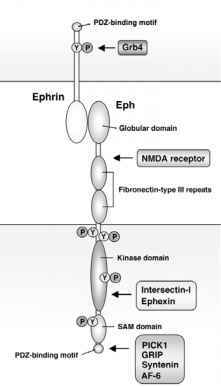 Now it is known that many ephrins and Eph receptors are expressed in the adult brain, especially in synapses. Because both PICK1 and GRIP were believed to be predominantly concentrated in postsynaptic sites, it was natural to speculate that Eph receptors were present in postsynaptic sites, whereas ephrin ligands were present in presynaptic sites. Indeed, subcellular localization studies have identified EphA4, EphA7, EphB2, and EphB3 in postsynaptic sites7,16, and B-ephrins are in axons and presynaptic sites17,18. However, the in vivo picture is not so simple. Along with a panel of Eph receptors, ephrinB2 is also present in the postsynaptic site16. B-ephrin localization in synapses differs depending on the site in the brain and the type of synapses. Further complicating the issue, there is evidence that the A-ephrin/EphA combination is expressed at the site of neuron-astrocyte contacts. Here, ephrinA3 is localized in astrocytic surfaces surrounding synapses, whereas EphA4 is localized on spines19. It should be noted that these observations regarding synaptic localization of ephrins and Eph receptors have been made mainly in glutamatergic synapses. EphB receptors were not found in GABAergic synapses formed directly on dendritic shafts8,20. Although there is still some controversy about the cellular process how dendritic spines are formed, whether or not they are derived directly from dendritic filopodia that have made contacts with axons, it is clear that some cell surface recognition events between presumptive pre- and postsynaptic neurons play a key role in the morphogenesis of spines. Moreover, the formation of such specialized membrane appendages almost certainly involves localized signaling that leads to local reorganization of cellular (membrane, cytoskeleton) architectures. Being a cell contact-triggered signal transduction system, the ephrin-Eph system appears to possess necessary properties for carrying out such a role. The function of EphB receptors in spine formation was first demonstrated by Ethell et al.20. Transfection of kinase-inactive EphB2, which acts in a dominant negative manner to signaling by all EphB receptors, inhibited spine formation in cultured hippocampal neurons. Dendritic protrusions in neurons transfected with kinase-inactive EphB2 remained as immature, filopodium-like protrusions even at 21 days in vitro. The number of AMPA receptor clusters was markedly reduced as a result, whereas the number of synapses formed directly on dendritic shafts (mainly GABA receptors) was unchanged. Thus these results indicate that kinase-dependent signaling by EphB receptors is required for developmental spine formation. Subsequent studies demonstrated that activation of EphB receptor kinase signaling by exogenous B-ephrins (ephrinB1 and ephrinB2) is sufficient to induce spine formation in hippocampal and cortical neurons18,21. Furthermore, the observation made in EphB receptor knockout mice confirmed the physiological relevance of EphB receptor signaling in spine formation in vivo. In EphB1-/-,EphB2-/-,EphB3-/-triple knockout mice, a significant reduction in spine density and the prevalence of spines with no heads and of abnormally small size were demonstrated18. Interestingly, such an abnormal spine development was recapitulated in transgenic mice expressing a kinase-inactive, truncated EphB2 mutant on EphB2-/- background, indicating that cell-autonomous forward signaling is responsible for spine formation18. Together, these in vitro and in vivo data essentially confirmed the requirement of EphB kinase signaling in dendritic spine formation. The requirement of kinase activity is the crucial difference between the effect of EphB receptors on spine morphology and that on NMDA-dependent synaptic plasticity (see below). Meanwhile, much less is known about which ephrin(s) is involved in spine formation in vivo. Considering complicated patterns of ephrinB/EphB receptor expression, this question will need detailed analyses. At least in the case of spines in the CA3 pyramidal neurons, ephrinB3 and ephrinA4, both of which can activate EphB receptors, are expressed in the dentate gyrus neurons, which project to CA3 pyramidal neurons. This suggests that these ephrins are good candidates as physiological Eph ligands in these synapses. The observations described above have been made in the context of axon-dendrite contacts, which is presumably the major factor that drives spine development. Yet there is an indication that spine morphology is also regulated by astrocytes. Astrocytes are an integral component of mature synapses in vivo, with their processes closely enwrapping synapses22. At least one ephrin, ephrinA3, is expressed by astrocytes in the adult mouse hippocampus while the EphA4 receptor is highly expressed on the dendritic spines of hippocampal pyramidal neurons19. Furthermore, stimulation of hippocampal slices with ephrinA3 causes shortening of spines, and spines in EphA4-/- neurons are irregularly shaped and longer than normal19. Thus ephrinA-EphA signaling may be functionally involved in regulation of the morphological plasticity of spines through the crosstalk between astrocytic processes and extrasynaptic regions of spines. There is increasing evidence that ephrin-Eph signaling has a significant influence on synaptic plasticity15. The first observation suggesting the role for Eph receptors in synaptic plasticity was already made in the late 1990s. Gao et al.23 showed that extracellular application of soluble EphA5-Fc fusion protein impairs activity-induced changes in long-term potentiation (LTP) in mouse hippocampal slices, whereas ephrinA5-Fc induces LTP-like enhancement of basal synaptic transmission. Furthermore, infusion of EphA5-Fc into hippocampus resulted in impaired performance in behavioral paradigms, whereas infusion of ephrinA5-Fc enhanced performance24 and improved anesthesia-induced memory loss25. Then in 2001, two articles simultaneously reported changes in synaptic plasticity in EphB2 knockout mice17,26. These mice show deficits in NMDA-dependent, hippocampal synaptic plasticity and minor defects in spatial memory. Curiously, these phenotypes in synaptic plasticity and behavior were not found in EphB2lacZ knock-in mice, in which the wild-type EphB2 allele was replaced with truncated EphB2 lacking the tyrosine kinase domain26. Thus, the kinase activity of EphB2 is not required for its function in NMDA-dependent synaptic plasticity, which is in stark contrast to the function of EphB2 in spine morphogenesis. This, in turn, suggests that the underlying molecular mechanism for the regulation of NMDA-dependent plasticity may be the interaction of EphB2 with the NR1 subunit of NMDA receptors through their extracellular domains27. NMDA-independent synaptic plasticity is also regulated by EphB receptors. Contractor et al.28 showed that extracellular application of ephrinB1-Fc fusion protein impairs mossy fiber-CA3 LTP, which is believed to be dependent on presynaptic changes in glutamate release probability, whereas EphB2-Fc fusion protein enhances basal excitatory transmission and occludes subsequent LTP. Blocking of the interaction between EphB2 and the AMPA receptor-binding protein GRIP impairs mossy fiber LTP. Thus, the ephrinB-EphB receptor system is thought to exert a retrograde, trans-synaptic effect, which leads to presynaptic expression of long-term changes in glutamate release probability. Since GRIP binds both AMPA receptor (the C-terminus of the GluR2 subunit) and EphB2, a natural interpretation of these results is that the GRIP-mediated association between EphB2 and AMPA receptors might be the key to this effect on LTP. In view of recent findings on the molecular interaction of GRIP, however, the role of GRIP in this phenomenon may need further clarification. Fukata et al.29 showed by a proteomic approach that only a negligible fraction of GRIP in the brain associates with AMPA receptors. Meanwhile, the GRIP-EphB2 interaction has been reported to be critical for delivery of EphB to dendrites and morphogenesis of dendritic arbors30. The above observations generally point to postsynaptic Eph receptors in the regulation of synaptic plasticity. However, in CA3-CA1 synapses, ephrinB2 and ephrinB3 are postsynaptically localized16. What is the function of these B-ephrins? 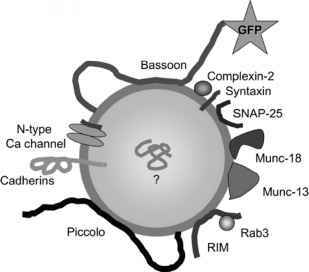 Recent data revealed that B-ephrins also play a role in the regulation of synaptic plasticity. In brain-specific ephrinB2 conditional knockout mice, CA3-CA1 hippocampal LTP and long-term depression (LTD) are impaired, whereas basal parameters of synaptic transmission are unaffected16. Similar changes were found in ephrinB3 knockout mice. EphA4 is considered a candidate receptor for postsynaptic ephrinB2 and ephrinB3, as EphA4 knockout mice display similar impairment in CA3-CA1 LTP16. The LTP defects in EphA4 knockout mice are independent of the EphA4 cytoplasmic domain. While the observations described above were all made in the context of synaptic plasticity in the cerebrum, there is evidence that ephrin-Eph receptor signaling is involved in other types of synaptic plasticity. Central sensitization is a form of synaptic plasticity that occurs in somatosensory neurons in the spinal cord following intense peripheral noxious stimuli, tissue injury, or nerve damage31. NMDA receptors are key mediators for central sensitization in the dorsal spinal cord. Battaglia et al.32 showed that EphB1 and B-ephrins (ephrinB1, ephrinB2, and ephrinB3) are expressed in the sensory system, and that injection of ephrinB2-Fc induces central sensitization. In the spinal cord, EphB activation by exogenous ephrinB2-Fc induces Src activation, which is postulated to be a mechanism that eventually leads to NMDA receptor activation32. The cytoskeleton of dendritic spines is composed predominantly of actin, and the motility of spines is governed by dynamic reorganization of actin cytoskeleton33-35. A wealth of evidence now indicates a crucial role for Rho family GTPases in spine formation (see ref. 36 for review). For instance, transgenic mice expressing constitutively active Rac1 have smaller but more numerous spines in Purkinje cell dendrites37. Hippocampal slices transfected with dominant negative Rac1 exhibit progressive elimination of spines38. In Drosophila, loss-of-function mutation of Cdc42 causes a reduction in spine density in the vertical system neurons39. Rnd1, a new member of Rho family GTPases, also affects spine morphology40. Thus it was tempting to speculate that EphB receptor signaling somehow connects to actin polymerization through Rho family GTPases. Irie and Yamaguchi9 demonstrated a functional linkage between EphB2 and Cdc42 via the GEF intersectin-l. Treatment of cultured hippocampal neurons with ephrinB2-Fc causes activation of Cdc42, which is temporally in parallel with EPhB2 activation. 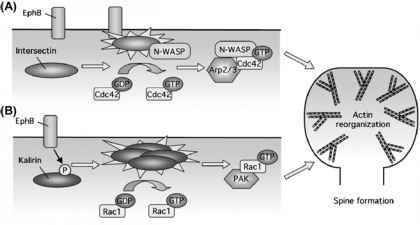 EphB2 associates with intersectin-l and its association enhances the intersectin's GEF activity in concert with N-WASP, which also binds intersectin-1 (Figure 10.2; Colorplate 7). Dominant negative forms of Cdc42, intersectin-l, and N-WASP all inhibit spine formation in cultured hippocampal neurons9. These results indicate that Arp2/3-mediated actin polymerization plays a role in spine formation. The role of Arp2/3 in spine formation has also been suggested by a cortactin knockdown study41. Penzes et al.21 demonstrated a Kalirin-Rac1-PAK pathway as another signaling cascade downstream of EphB2 (see Chapter 17). Here ephrinB2-mediated EphB receptor activation induces synaptic translocation of Kalirin, which is, like intersectin, a GEF. Activated Kalirin then activates the Rac1-PAK pathway. Dominant negative forms of Rac1 and Kalirin-7, as well as a fusion protein of the PAK1 inhibitory domain, block spine formation in cultured hippocampal neurons21. Antisense-mediated reduction of Kalirin expression in hippocampal slices results in a reduction in spine density, with dispersion of postsynaptic density markers and elimination of presynaptic endings42. It is noteworthy that these effects of ephrinB-EphB signaling on spine formation require the cytoplasmic domain of EphB receptors. In fact, several proteins present in synapses are phosphorylated by EphB receptors. Such proteins include syndecan-220, Kalirin-5 and Kalirin-721, Src43, and synaptojanin 1 (44; also see below). Phosphorylation of syndecan-2 is implicated in its clustering in postsynaptic sites, which is a critical step for this cell surface proteoglycan to induce spine formation in immature neurons20,45. Phosphorylation of Src is implicated in NMDA receptor-dependent calcium influx through Src-dependent phosphorylation of NMDA receptor43. Other downstream target molecules of Eph receptors, such as Abl and Arg, may have implications in spine formation, as they can affect actin polymerization via Ena/VASP proteins46. In Drosophila, Ena promotes the formation of both dendritic branches and actin-rich spine-like protrusions in dendritic arborization sensory neurons47. Figure 10.2. EphB Downstream Signaling Pathways Leading to Actin Polymerization and Spine Morphogenesis. (A) The Cdc42 GEF intersectin-l is recruited to the site of ephrinB-EphB signaling through its interaction with EphB receptors. Association of EphB2 and N-WASP has a synergistic effect to promote the GEF activity of intersectin-l, which in turn causes local activation of Cdc42. Together with N-WASP, activated Cdc42 triggers Arp2/3-mediated actin polymerization into a branched network9. (B) EphB receptors phosphorylate the Racl GEF Kalirin and induce its translocation to synapses and clustering. Activated Kalirin then stimulates the Racl-PAK cascade, resulting in actin rearrangement21. It is possible that other parallel pathways linking Eph signaling and actin polymerization exist in spines. For instance, the GEF Tiam1 plays a role in ephrin-Eph-mediated neurite outgrowth10. Another GEF, Vav2, has been reported to have a critical function during ephrinA1-induced axon repulsion. Binding of ephrinA1 to EphA receptors on the growth cone triggers Vav2-dependent endocytosis of the ligand-receptor complex48. Although the role of these novel pathways has not been investigated in the context of spine formation, it is likely that the list of GTPases and GEFs involved in spine formation will grow. Transport of neurotransmitter receptors to and from postsynaptic membranes is of critical importance in the regulation of synaptic function and efficacy. In excitatory synapses, AMPA-class glutamate receptors undergo dynamic trafficking between the postsynaptic membrane and intracellular site49,50. In this vein, it is interesting that there is increasing evidence indicating the role for the ephrin-Eph system in endocytosis and intracellular vesicle trafficking. One of the remarkable findings in this regard is bidirectional internalization of the ephrinB-EphB complex upon contact between cells expressing EphB receptors and those expressing B-ephrin ligands51,52. This process is similar to phagocytosis, clearly distinct from clathrin-mediated endocytosis, and requires the cytoplasmic domain of both receptor (EphB2) and ligand (ephrinB1). Treatment with cytochalasin D or perturbation of Rac1 activity inhibits this bidirectional internalization51. These findings provide an explanation how an initial, contact-based ephrin-Eph interaction results in a physical separation of two cells during growth cone repulsion. It is interesting to see whether a similar mechanism operates in synapses and spines, and if so, how such a mechanism plays a role in the regulation of morphological plasticity of spines. Another recent finding highlights a direct role for EphB receptors in the regulation of AMPA receptor endocytosis. In the search for novel EphB kinase substrates, Irie and colleagues44 found that synaptojanin 1, a key accessory protein for clathrin-mediated endocytosis with phosphatidylinositol-phosphatase activity53, is phosphorylated in its proline-rich domain by EphB2. This domain binds another endocytic protein, endophilin (Figure 10.3). Both synaptojanin 1 and endophilin are essential for clathrin uncoating, a late step in clathrin-mediated endocytosis54. EphB2-dependent tyrosine phosphorylation of synaptojanin 1 inhibits its interaction with endophilin. In EphB2-expressing cells, treatment with ephrinB2 elevates the level of phosphatidylinositol 4,5-bisphosphate (PIP2) via inhibition of phosphatidylinositol-phosphatase activity of synaptojanin 1 and promotes clathrin-mediated endocytosis, whereas both a kinase-inactive EphB2 mutant and a phosphorylation site mutant of synaptojanin 1 neutralize the effect of ephrinB2 on endocytosis44. Thus these results indicate that ephrinB-EphB signaling regulates clathrin-mediated endocytosis by influencing protein interactions and phosphoinositide turnover through tyrosine phosphorylation of synaptojanin 1. In the postsynaptic neuron, AMPA receptors are endocytosed by clathrin-mediated mechanisms 55,56. Both the kinase-inactive EphB2 and phosphorylation site mutant of synaptojanin 1 block ligand-induced AMPA receptor endocytosis in hippocampal neurons44. Thus, ephrinB-EphB receptor signaling may regulate synaptic plasticity by altering endocytic activity in the postsynaptic site. This does not necessarily mean that EphB-synaptojanin 1 signaling should occur in synchrony with the endocytic cycle. Enhanced levels of synaptojanin 1 phosphory-lation may provide a long-lasting condition in which AMPA receptor endocytosis occurs more efficiently. An important unanswered question is whether and how dephosphorylation of synaptojanin 1 is regulated. If such a mechanism (which likely involves tyrosine phosphatases) exists, it could also affect synaptic plasticity by modulating AMPA receptor endocytosis in a direction opposite to EphB receptor activation. Figure 10.3. 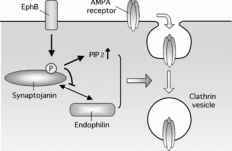 Model for the Role of EphB Receptor Signaling in AMPA Receptor Endocytosis. Activated EphB2 phosphorylates synaptojanin 1 in its proline-rich domain. This inhibits the phosphatidylinositol-phosphatase activity of synaptojanin 1 and binding to endophilin, leading to the elevation of cellular PIP2 levels and the stimulation of the initial phase of clathrin-mediated endocytosis of cell surface molecules, including AMPA receptors44. Finally, a recent article by Cottrell et al.57 provides a possible link between the EphB receptor effect on spine formation and that on endocytosis. CPG2 is a synapse-specific protein playing a role in endocytosis of AMPA receptors. Interestingly, RNAi-mediated CPG2 knockdown causes not only a reduction in AMPA receptor endocytosis but also a reduction in spine size. This result indicates that supply of membranes from internal membrane organelles may be one of the critical elements that determine the size of spines. Dendritic spines contain endosomal compartments, which serve as a store of recycling membrane58. The plasma membrane as well as receptor proteins are delivered to endosomes by endocytic pathway59. Thus, ephrinB-EphB signaling might be involved in spine formation and plasticity by not only the effect on actin cytoskeleton but also the effect on membrane trafficking.